Crazy Growth: The percentage of organizations running SharePoint Online rose from 22% in 2016 to 56% in 2017. And It’s Only the Beginning - More than half of all commercial (business) Office users are using Office 365 rather than standalone/perpetual Office and Microsoft is expecting two-thirds of its business Office customers will be using Office 365 in 2019. Those stats are enough to make anyone perk up and take notice! But as information professionals, we're focused on what this all means for the way we manage, store, and protect all of our information. 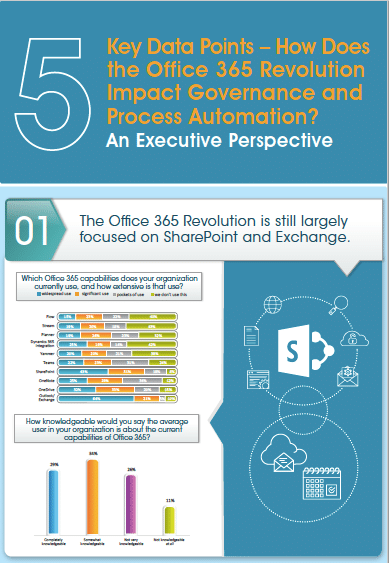 In this FREE infographic, we've included 5 key data points focused on how the Office 365 revolution is impacting governance and process automation.